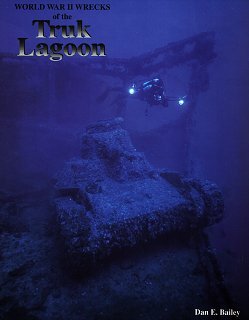 "World War II Wrecks of the Truk Lagoon"
Splendid maps of each of the islands in Truk, included numerous detailed blow-ups showing Japanese military facilities and the U.S. intelligence estimates as to all defensive armament and targets to be found in each map. Hundreds of pages of detailed action reports for each American unit involved in Hailstone, strike by strike. Numerous personal recollections of the American pilots involved in the action. Many rare combat photographs of the various actions during Hailstone. Fine illustrations of each major and many minor vessels sunk at Truk, as well as their characteristics, background history, stack markings and company flag, and other information. 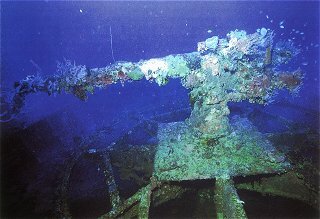 Detailed description of each wreck, including plan drawings of each vessel as she appears on the bottom (including cargo descriptions and locations of artifacts), numerous underwater photos of each vessel, and individual dive notes describing depth and other technical data required by divers. In summary, I can't say enough good things about this book. It is an exemplary work that meets the needs of several audiences. With 250+ color and black&white photos (the majority being color), and 173 maps and illustrations, it has all the "eye-candy" anyone would ever want, and is handsome enough for display. Yet it is incredibly detailed in its historical treatment, and provides the serious WWII historian with a wealth of useful, well-organized information. Anyone who is even moderately interested in Truk should own a copy--it is worth every single penny you'll spend on it. "A+" rating. You can order it from the author's Web site http://www.northvalleydiver.com/, or from Amazon.com. Get it; you won't be sorry.